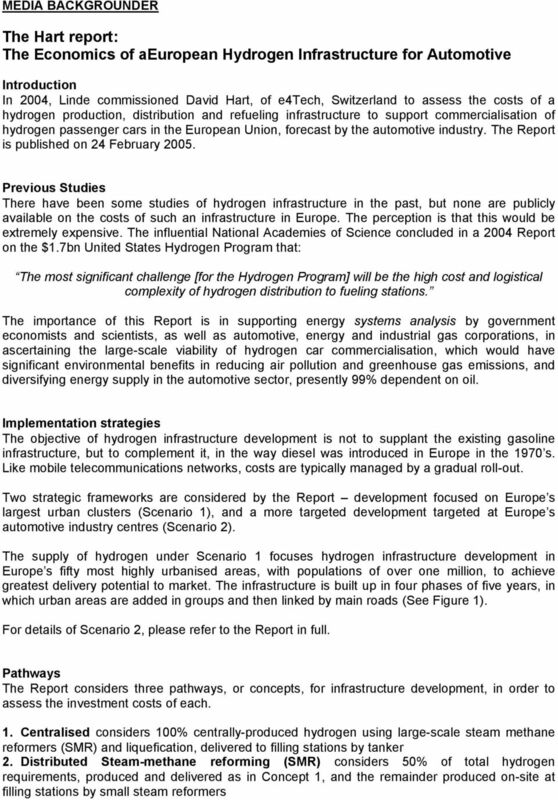 Download "The Hart report: The Economics of aeuropean Hydrogen Infrastructure for Automotive"
2 3. 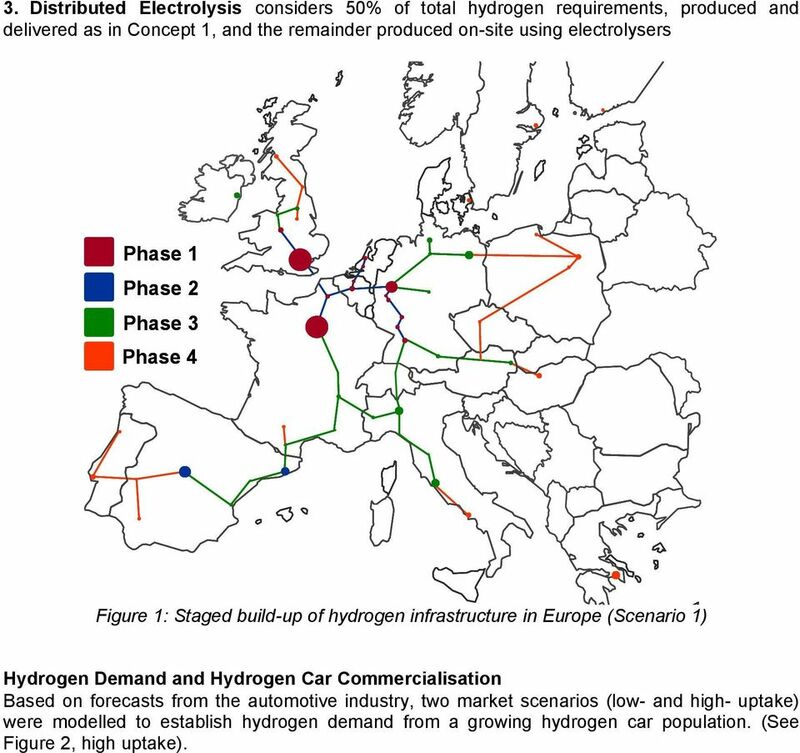 Distributed Electrolysis considers 5% of total hydrogen requirements, produced and delivered as in Concept 1, and the remainder produced on-site using electrolysers Phase 1 Phase 2 Phase 3 Phase 4 Figure 1: Staged build-up of hydrogen infrastructure in Europe (Scenario 1) Hydrogen Demand and Hydrogen Car Commercialisation Based on forecasts from the automotive industry, two market scenarios (low- and high- uptake) were modelled to establish hydrogen demand from a growing hydrogen car population. (See Figure 2, high uptake). 5 Number of fuelling stations Austria Denmark France Greece Italy Portugal Sweden Norway Hungary Poland High uptake Belgium Finland Germany Ireland Netherlands Spain United Kingdom Switzerland Czech Republic Germany United Kingdom France Italy Spain Figure 5: Fuelling stations by country, high uptake case, scenario 1 3. 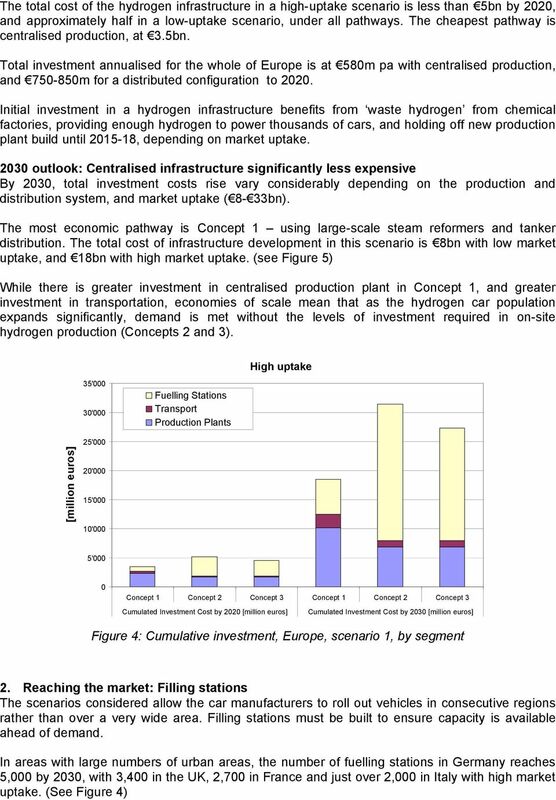 Investment costs vary by country (see Appendix A) The investment costs of each country depend on the strategic plan for hydrogen infrastructure build-up in that country. 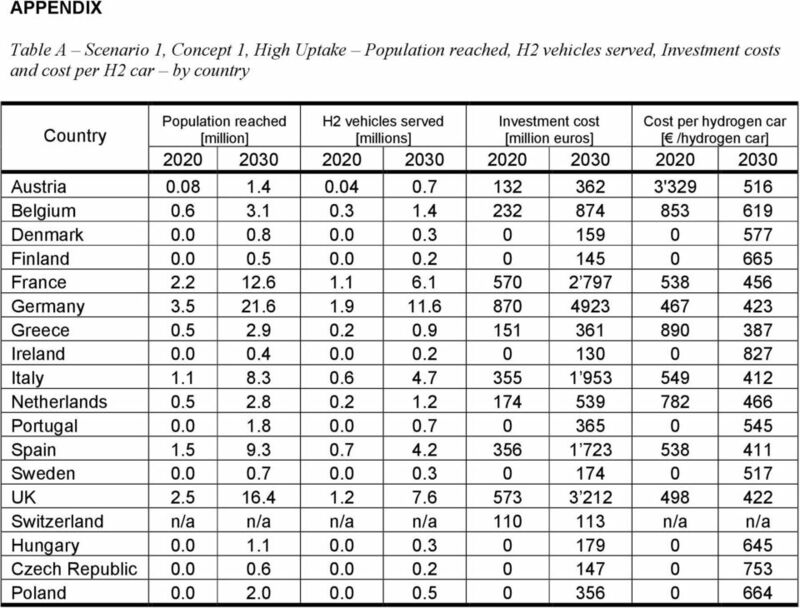 Under the population-targeted scenario, total investment costs are disproportionately greater for Belgium, Denmark, Germany, Greece, Portugal and the UK [note 1], due to a high level of urbanisation relative to the total population of these countries. 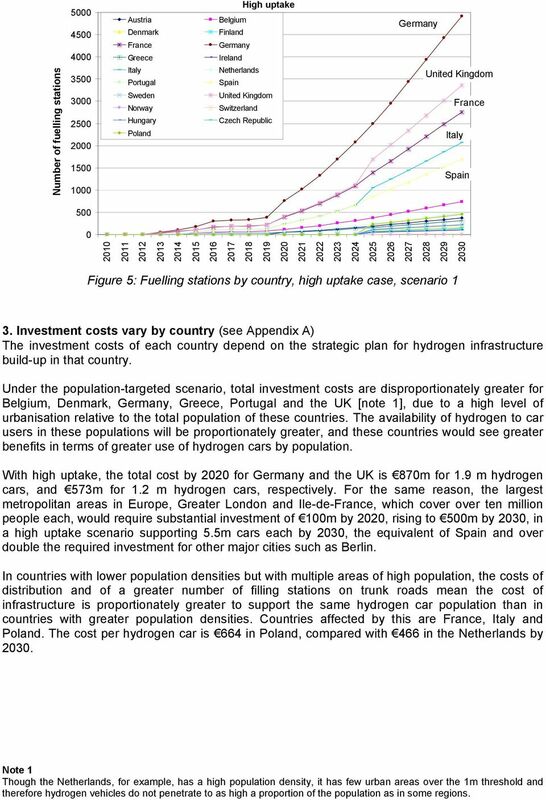 The availability of hydrogen to car users in these populations will be proportionately greater, and these countries would see greater benefits in terms of greater use of hydrogen cars by population. With high uptake, the total cost by 22 for Germany and the UK is 87m for 1.9 m hydrogen cars, and 573m for 1.2 m hydrogen cars, respectively. For the same reason, the largest metropolitan areas in Europe, Greater London and Ile-de-France, which cover over ten million people each, would require substantial investment of 1m by 22, rising to 5m by 23, in a high uptake scenario supporting 5.5m cars each by 23, the equivalent of Spain and over double the required investment for other major cities such as Berlin. 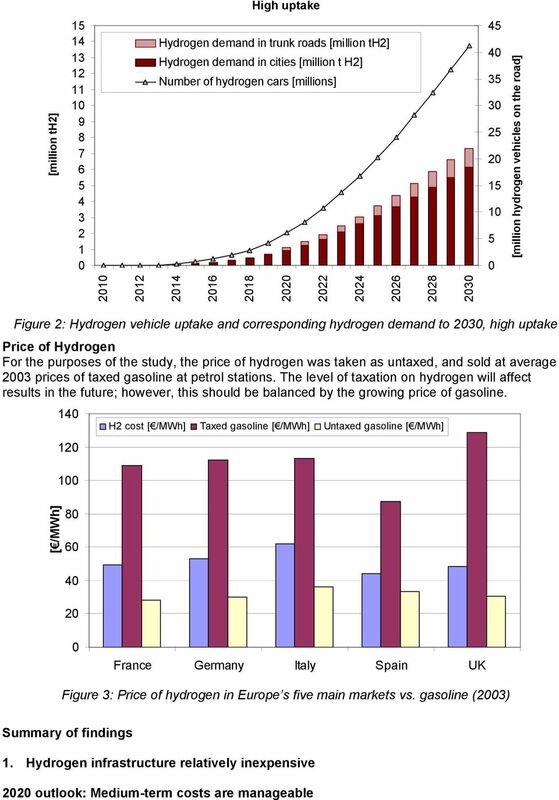 In countries with lower population densities but with multiple areas of high population, the costs of distribution and of a greater number of filling stations on trunk roads mean the cost of infrastructure is proportionately greater to support the same hydrogen car population than in countries with greater population densities. Countries affected by this are France, Italy and Poland. The cost per hydrogen car is 664 in Poland, compared with 466 in the Netherlands by 23. Note 1 Though the Netherlands, for example, has a high population density, it has few urban areas over the 1m threshold and therefore hydrogen vehicles do not penetrate to as high a proportion of the population as in some regions. How sensitive are consumers to expected future gasoline costs when they make new car purchases? Sky Europe The Ipsos Affluent Survey: Europe The Ipsos Affluent Survey: Europe what is it? The Ipsos Affluent Survey: Europe (formerly called the EMS ) is a survey of the most affluent people within Europe.